June 4 2016. A select field of nearly 100 of the fastest Masters L-o-o-o-n-g Distance Runners is assembled in San Diego to test their mettle on the Rock n Roll Half Marathon course tomorrow. The Competitor Group Incorporated puts on a terrific race and the Masters Athletes are thrilled to be a part of the excitement. This is the 4th stop on the Masters Grand Prix tour and will be the 3rd and last West Coast race this year. The remainder of the 2016 circuit consists of the One Mile Road Race—Flint Michigan—August 26; 5K Road Race—Syracuse NY—October 2; 15K Road race—Tulsa OK—October 29; USATF Masters 5K XC Championship—Tallahassee FL November 6; Club XC Championship in Tallahassee FL in December. The course starts next to Balboa park and winds up through San Diego neighborhoods to the Normal heights Neighborhood. As one might expect from the name that is the site of the toughest hill. If the gradient map posted on the RnR website is correct, once the runners have crested that hill, it is pretty much either flat or downhill the rest of the way. Strong closers should find the course to their liking. Individual and team titles are on the line, as well as points for the Grand Prix. The previews and predictions below are all offered in good fun and with the understanding that predicting is tough. Occasionally I am provided with inside information on a runner who is subpar or has had to withdraw but generally the race-specific runner fitness is unknown in advance. First are the Individual Races and then the Teams. Men. Last year the Overall Masters race was pretty much a forgone conclusion. Meb Keflezighi was entered in both the Open and Masters Half marathon. The course is not record-eligible for the Half marathon but is record-eligible through the 15K and 10 Mile marks where the CGI placed timing mats and had all of the necessary equipment to assure records would be certified if they happened. And, to no one’s surprise they did. Keflezighi now holds the 15K and 10 Mile Masters records with times of 44:23 and 47:39 respectively. 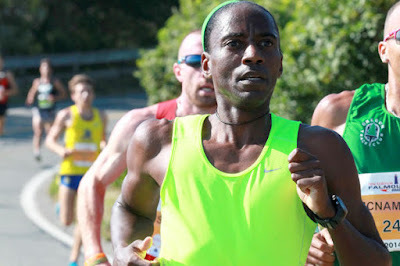 Even the great Masters Runner, Kevin Castille, could not quite keep pace with Keflezighi. Meb finished in 1:02:29 with Castille in 1:04:50. Another 2 minutes back was Clint Wells claiming the bronze medal in 1:07:14. Castille is back this year and looks to be the strong favorite. But it may not be as clear cut as times would indicate. Castille had a remarkable comeback from an injury plagued fall to get his Olympic Trials qualifier with a 1:04:33 at the Jacksonville Bank Half Marathon. He had a very good first half of the Olympic marathon Trials in 1:09:22 but a plantar issue that had plagued him in the fall was asserting itself enough that Castille decided to call it a day at the halfway point. I cannot find any race results for him since then. We will find out on Sunday if Castille has fully recovered. With neither Keflezighi nor Wells entered, it does not appear that Castille will need to be at his best to win. Unless there is a last minute entry at the Expo, it does not appear that anyone else is capable of breaking 1:10. John Gardiner finished 4th last year in 1:10:04 (chip). He had some injuries earlier in the year but let’s hope he has returned to full fitness and at least gives Castille someone to think about. Okwaro Raura may also be in the hunt for a podium position. I cannot find any recent road event results for him but he is listed on the USATF entry sheet as having a recent 1:11:25 half marathon (or equivalent) to his credit. Others who could factor in are Albuquerque’s Brantley Lutz and Southern Cal’s Christian ‘Cush’ Cushing-Murray and Tony Torres. Last year Lutz covered the RnR course in 1:13:07, with Cushing-Murray not far behind in 1:13:55. And Torres is listed on the USATF entry sheet for a 1:14:07 Half Marathon. Women. Last year Jen Rhines had the same effect on the Women’s side that Meb did on the Men‘s as she stormed to the Masters win with a 1:16:36. Celestine Arambulo and Maureen Bean Wrenn were 5 minutes back in 2nd a 3rd. Terri Rejimbal was just a half minute back in 4th. None of those 4 are entered this year. Rejimbal had expected to run but her training has been hampered by a metatarsal stress fracture. In their absence, the podium will have an entirely different set of faces. Women. The favorites for the Age-Grading appear to be Honor Fetherston, Edie Stevenson, Deborah Torneden, Suzanne Morris and Joanna Rowland. If Fetherston can match the 1:32:03 she ran last year, she will crack the 91% barrier. But she has been battling injuries and was somewhat off her game at the 8K in Brea. A month later in a 15K she was still a bit slower than her norm. It may be tough for her to crack the 90% barrier. Stevenson has been on a roll recently, winning the Age-Grading contest at the 8K at Brea and at the 10K in Dedham, cracking the 93% mark. Her 1:15:33 at the Cherry Blossom 10 Miler suggests she should be ready to age grade better than 91% at the Half Marathon. Torneden took the Age-Grading crown at the 15K Championship at Tulsa last year with an 89% on a very tough course. That suggests she can break 90 and perhaps 91% on this Half Marathon course. Rowland has been a consistent age-Grading podium finisher this year although she was not able to do that at Dedham. Morris came ahead of Rowland in the 8K and if she can match the 1:32:22 she ran last year in the San Diego Half Marathon, she can get very close to 90%. Stevenson, Torneden, Morris. Men. If Kevin Castille can run anywhere near his normal time, he should run away with the Age-Grading on the Men’s side, bbreaking the 90% barrier and perhaps approaching 93 or 94. The only other runner likely to crack 90 is Fred Zalokar. Zalokar has run a lot of Half Marathons and Marathons in the last year and typically runs his Halves between 1:15 and 1:17. If he can run in the lower end of that range, he can crack 90%. It is hard to choose between 8 runners who can all age grade between 85 and 89 percent. If Kevin Broady can match the 1:16:32 he ran at the Surf City USA Half, he can age-grade in the high 80’s but if he runs closer to the 1:19:34 he ran at the Southern California Half it will be only mid-80’s. Rob Verhees ran a 2:37:53 in the TCS New York Marathon but only managed a 1:17:02 in the La Jolla Half. Perhaps running in his hometown will help him to raise his game for this event. Gardiner and Cushing-Murray age graded at 86.8 and 85.9% respectively. Jerome Vermeulen, Jeff Creighton and Kevin Zimmer can all hit that mid to upper 80’s range that can take the third spot on the age-grading podium. Kevin Castille, Fred Zalokar, Rob Verhees. M40. Castille, Gardiner, and Lutz are all from this age group so the comments on the overall race hold for this group as well. W40. The same comments apply here. Jaten, Corno, Fenster. M45. It is tough to bet against the core of the Cal Coast group, Christian Cushing-Murray, Tony Torres and Jerome Vermeulen. Colorado’s Steven Fenster could crack that top 3. Last year Cush ran a 1:13:55 with his teammate Vermeulen about a minute back. Their teammate, Torres, ran a 1:14:02 at the Big Sur Half Marathon. Fenster ran a 1:15:47 at the Runners Den/Fiesta Bowl Half Marathon but most of his other Half Marathons have been in the 1:16 to 1:17 range. He will need to match or better his Fiesta Bowl performance to crack the podium if the Cal Coast 3 are all on their game. W45. This is an easy age group to handicap. It appears that Jessica Stanford is the only entrant. She ran 1:32:34 last year in this race, finishing 7th. But she ran a 1:30:42 Half Marathon this spring so she may be ready for a faster race this year. M50. The top two runners from last year are pursuing other possibilities. That leaves the race open for Jeff Creighton and Kevin Zimmer who finished 3rd and 4th only 4 seconds apart in 1:17:12 and 1:17:16 respectively. It should be a terrific contest again this year. Rob Verhees and Kevin Broady are set to challenge them. If Verhees can match the 1:17:02 he ran in the La Jolla Half, he will be right in the thick of things. If Broady can match his 1:16:32 from the Surf City Half, he can win the group. W50. Unlike the 45-49 group, which has only one top runner, this group is packed with talent. California’s Kirsten Leetch may be the favorite but she could well be pressed by Mary Alico from Texas another California runner, Mary Lynch. Utah’s Michelle Simonaitis and Southern Cal’s Kathleen Cushing-Murray could be in the mix as well. Cushing-Murray is the defending Champion in the Age Group with a 1:31:37 last year but Simonaitis, who finished 5th in the 45-49 group last year, had a faster time, 1:30:43. Leetch has a 1:28:40 listed on her USATF entry line but I cannot find a long race that supports it. Certainly if she could carry anything close to her pace in the 8K at Brea over to this longer distance, she will be a factor, but most of her races seem to be 8K or shorter, which raises some questins about her staying power. Alico has a 1:29:16 Half Marathon to her credit from last fall and a comparable 1:02:42 15K this spring. Lynch ran a 1:29:39 in the Surf City USA Half this February and had a 1:31:12 in the Southern California Half in January. M55. Last year there was a fantastic field in this group; Fred Zalokar won it with a 1:15:32, but Brian Pilcher was 2nd with a 1:15:57. Adam Weiner was less than a minute back and both Tom Dever and Joe Sheeran cracked 1:18. But only Zalokar from that group is back. 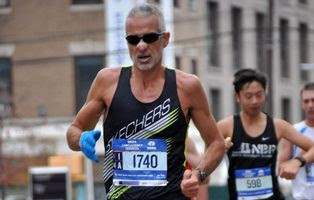 William ‘Hugh’ Enicks will give him something to think about; he is only two years removed from a sub 1:19:14 Half Marathon and 18 months from a 2:52:20 at the USATF Masters Marathon Championships. Gregory Cauller ran a 1:25:15 Half Marathon in April of this year. W55. Last year Nancy Hatfield won this division in 1:41:46. Hatfield is not back but four others who are likely to break 1:40 are entered. Deborah Torneden is the favorite based on her 1:28:35 Half Marathon last fall, coupled with a very comparable 1:01:34 in the 15K at Tulsa. Atlanta’s Mary Sweeney could press her though. Sweeney ran a 1:31:36 Half Marathon last fall but could only muster a 1:34:15 this January. 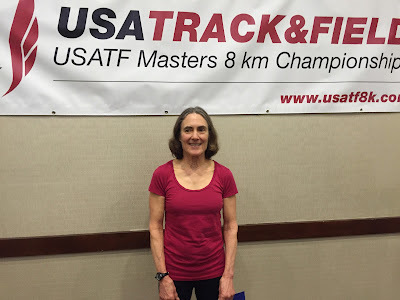 Still, her 41:47 at the recent 10K Masters Championship in Dedham suggest she is race fit and ready to go. Suzanne Morris should be in the mix as well based on her 1:32:22 at the San Diego Half Marathon this February. Should any of those three falter, Janet Smith ran a 1:39:48 at a Half Marathon this past November. M60. Charles Locke took this division last year with a time of 1:34:22. Neither Locke nor the other two who made the podium have returned but it should be more competitive this time. There are several runners likely to improve on that time. Pete Gibson from North Carolina takes on a trio of Californians. Gibson ran a 1:21:03 Half last October when he was 59. In January he gave a further signal of what to expect by running a 1:01:32 10 miler and a 58:09 15K. He turned 60 this spring and seems ready to roar. Perry Forrester tops the Cal Coast bunch based on the 1:27:34 Half Marathon he ran just a month ago. John Holcomb is a very strong Cross Country and short distance specialist but I cannot find any races over 8K for him. So this race is likely a little outside his comfort zone. Keith Witthauer has some distance chops as he ran the RnR Full Marathon last year in 3:10:50 and Boston this spring (on a hot day) in 3:37:15. Still a sub 1:30 is likely a push for him. Bruce Kirschner from Colorado will be hunting for a good result too. He enjoys longer races as evidenced by his 1:10 in a 10-miler this Spring and a 1:03:44 on a tough 15K course in Tulsa last October. He and Witthauer could well be locked in a battle for the third spot on the podium, with Witthauer having the ‘Home Course’ advantage..
W60. Honor Fetherston should have no trouble defending her title if she is at all fit. She took the Gold Medal last year in 1:32:03. Laurel Collins and Sue Macdonald are running for Impala but will also contest for the podium on their own account. Tina Breen of the San Diego TC will try to defend the home turf. Collins ran the marina Bay Half Marathon in 1:51:15 a year ago and Macdonald ran the Humboldt Redwoods Half marathon in 1:51:47. Both have a couple of other sub-2 hour half marathons in the last year or so. M65. Until a week ago I was prepared to write that there would be a terrific contest between 2015 M65 Runner of the Year, Lloyd Hansen and Peter Mullin who just moved up from the 60-64 division this year. Last fall Hansen ran nearly 3 minutes faster in the USATF 15K at Tulsa but Mullin outran Hansen by 40 seconds at the 12k at Alexandria. But Hansen is having a painful bout with sciatica and had to withdraw as the diagnosis is in process and the condition is very painful. That leaves it wide open for Mullin. Hank Sullivan finished 2nd last year in 1:34:27 and will likely have to be satisfied with a Silver Medal again.. Mullin is only two years removed from a late winter/early spring when he ran 3 half marathons in under 1:25, two of them under 1:22. Even if he is not quite as fit as he was then, breaking 1:30 should be no problem if he is coming in as healthy and fit as it appears. Coming in ahead of Bill Dixon at the 10K in Dedham in April is a marker that he has largely returned to his form of a couple of years ago. Mullin, Sullivan. W65. Last year Jo Anne Rowland took the Gold Medal in 1:46 while her teammate, Janet Cain took the Silver Medal in the W60 contest in 1:55. 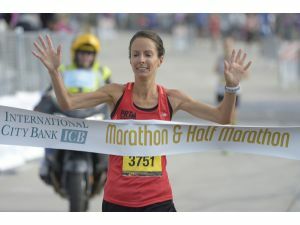 This year Boulder’s Edie Stevenson should make the Half Marathon her 3rd Gold Medal in a row, following her victories in the 8K at Brea and the 10K at Dedham. In between those two races she averaged 7:30 per mile for the Cherry Blossom Ten Miler so she appears set for the distance. Jo Anne Rowland will probably have to settle for the Silver Medal even as she and her teammates celebrate another team victory and another link in the chain for their effort to win the 60+ Club Grand Prix. Rowland finished 2nd to Stevenson at Brea and Dedham and in her 10 mile run this spring she averaged just over 8 minutes per mile. Her teammate, Janet Cain, ran 4 Half marathons over the second half of 2015 and finished them all I the 1:50 to 1:53 range. If she can match those efforts, she should earn the bronze medal. M70. After I won the M70 medal at the USATF 10K Championship in Dedham in late April, I was prepared to immodestly pick myself to win this race. The Half Marathon is one of my favorite distances and I am only two years removed from a sub 1;30 effort. But three days after that race I strained my hamstring. The hamstring is now responding to a regime of no running, just cross-training, and it seems likely I will be ready to reincorporate running into the training soon, but I will not race in the Half Marathon. That leaves the race wide open for Przemek Nowicki who is rounding into shape but views the Half Marathon as being a little outside his range. He was able to average a little over 7 minutes per mile at the USATF 12K Championships last year. He is not as fit as that but should still be able to run in the low 1:40’s and that may be enough for the win. He is running primarily for his team but may well get the side benefit of an individual victory. Richard Kutzner could well push Nowicki; he ran the LA Marathon in 3:49:13. That suggests a 1:45 would not be out of reach and he might run faster on this course. If either of those two have an off day, David Cohen typically is running his Half Marathons in the low 1:50’s. W70. Last year Norma Thomas led Carol Turner across the line in 2:01:33; this year Irene Terronez is in a class by herself. M75. Hans Schmid should take the title; he ran 1:48:32 in a Half Marathon in early 2015. Jerry Coletto is listed on the USATF spreadsheet as a 1:55 equivalent Half Marathoner but I cannot find any results for him. Phillip Kroll ran a Half Marathon in Toronto a month ago in 2:03:15, a little faster than he ran the Dexter-Ann Arbor Half Marathon last June. M80. Last year Richard Burch ran this solo, winning in 2:30:42. This year there are two contenders, Richard Williams and George Yannakakis. Williams was 79 last year when he won the M75 in 2:13:02. But Yannakakis ran a 2:06:15 at the USA Rock n Roll Half Marathon in Washington D.C.three months ago. This is the first year USATF included a team competition in the Half Marathon. Not surprisingly not many teams took up the challenge in the first year. Three divisions that have a real competition, the W40+, the M50+ and the M70+. The other divisions have only one complete team entered; if they have 3 finishers they win the division. M50+. The Cal Coast Track Club [R. Arsenault, V. Lowder, G. Quinonez, T. Schumann] from the greater L.A. area and the home town Prado Racing Team [J. Creighton, R. Verhees, K. Zimmer] will go head to head. Prado is the favorite; I picked Verhees for 1st, Creighton for 3rd and Zimmer for 4th. If they run true to form they should win by minutes even though Cal Coast has a very strong team. The one potential weakness of Prado is that they have only 3 runners. If any one of those three has an off day, it is possible for a team like Cal Coast to pack their top 3 runners in between Prado’s top two and their 3rd runner. M70+. The Ann Arbor Track Club [Paul Carlin, David Cohen, Malcolm Cohen, Phillip Kroll], the Shore AC [Przemyslaw Nowicki, J.L. Seymore, Edward Smith], and the Tamalpa Runners [Jerry Coletto, Bob Cowdrey, Hans Schmid] will lock horns in the only fully contested division. Before Paul Carlin [yours truly] had to drop out of the race due to the hamstring injury, Ann Arbor had high hopes but now they will be happy to field a complete team, take home the points available for the Grand Prix and hope for better results in the second half of the season. Because the race is determined by total time of the 3 runners, the 3rd man in may be most critical. Cowdrey of Tamalpa runs his Marathons in 5+ and his Half Marathons a bit under 2:30. If the Shore AC’s Edward Smith is the Edward Smith of Delray Beach Florida, a couple of years ago he was running his half marathons in 2:14 to 2:15, about ten minutes faster than Cowdrey. JL Seymore should be able to run right around 2:00:00 or a bit under. If the USATF sheet is correct about Coletto, that gets Tamalpa back 5 minutes of the time I have them behind. Then it would come down to Nowicki vs. Schmid and there I give the edge to Nowicki. Shore AC, Tamalpa Runners, Ann Arbor TC.